Boland won the singles and doubles tennis tournaments at the 1896 Olympics, but only went to watch the Games. John Pius Boland: Ireland's first Olympic gold medallist. THE RIO OLYMPICS will top off years of blood, sweat and tears for hundreds of the best athletes in the world right now. Olympic glory didn’t always mean devoting your life to sport though. The strict diets and intense training that today’s athletes abide by weren’t as closely linked to success in the early days of the Olympics. John Pius Boland was the first Irish person to win gold at the Olympics, but he hadn’t fancied his chances too much when heading there — he only went along to watch. 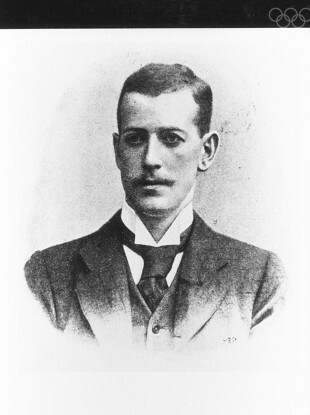 Boland won both the singles and doubles tennis competitions at the 1896 Olympics. An impressive result for any of the world’s top tennis players; even more impressive when Boland hadn’t even much time practising on the court. In fact, he wasn’t even that fond of tennis. Boland came from a well-off family in Dublin — the bakers of Boland’s Mills fame. He grew up with a private education, living on Capel Street before going to secondary school in Birmingham. He went on to study law in Oxford, and was in the middle of his studies when talks of reviving the ancient tradition of the Olympic Games were started by the Frenchman Pierre de Coubertin. Boland did have a keen interest in sports growing up and when he spotted a notice about the Olympic revival, he became immediately interested and was determined to be there if possible. As it happened, one of the secretaries on the first organising committee for the Olympics, a Greek man named Manos, was also in Oxford in 1895. Boland got in touch with him and organised a breakfast party between himself and some of his athletic friends, who might also be interested in heading to Athens for the games. Boland went abroad to study for a semester in Bonn, Germany, and it was from here that he made his journey to Greece for the first modern Olympics in 1896, taking in a few sights on the way. Boland was heading to Athens to watch the competitions, and never intended taking part. He did play tennis recreationally, but described the sport in his journal as “decidedly inferior” to cricket. During a dinner with a Greek athlete called Dionysios Kasdaglis, however, Boland learned that there weren’t many entries in the tennis competition. He agreed to enter both singles and doubles, despite not being prepared to play at all. He found a “tennis bat of sorts” easily enough but had no luck in finding a pair of tennis shoes; he played the competition wearing his normal leather shoes. Some of the other competitors were also taking advantage of the low entries. It made for an interesting bunch taking part, including a Serbian weightlifter and English hammer thrower. Boland’s own doubles partner was a German 800m runner, Friedrich Traun. Boland beat three Greek opponents to reach the final of the singles competition, where he played Kasdaglis — the man who had persuaded him to enter — and he became the first Irish person to win gold at the Olympics. Boland also won the doubles competition with his German partner Traun. Not a bad haul for a man who went to the Olympics to watch. Only six other Irish people have managed to bring home gold medals from the Olympics since: Pat O’Callaghan, Bob Tisdall, Ronnie Delany, Michael Carruth, Michelle Smith and Katie Taylor. His medals and place in the history books secured, Boland graduated from Oxford the following year and was called to the bar, although he never practised law. He was later elected as an MP for Kerry South as a member of the nationalist Irish Parliamentary Party. – An earlier version of this article incorrectly omitted Ronnie Delany, winner of the 1500m in 1956, from Ireland’s list of gold medallists. Email “John Pius Boland: The story of the spectator who won Ireland's first Olympic gold”. Feedback on “John Pius Boland: The story of the spectator who won Ireland's first Olympic gold”.